So, let’s not waste anymore time getting to the real story. Good schools makes researchers who are good at math…. So, much of this session has been spent in a sort of holding pattern. We’ve not been debating many bills with much substance. Because we’ve all been waiting for this big $250,000 report on education by Dr. Lori Taylor that was going to, once and for all, help us define how much it would take to adequately fund the state’s public schools. The prevailing thought was the report would show that the state could spend less on education than what the Kansas Supreme Court has indicated. The holding pattern was (again theoretical) done so that we’d have these numbers upon which to base school finance, and by extension, the state’s budget. Turns out that Dr. Taylor’s report said we’ve not spent nearly enough on education. The most conservative estimate is that we need to pony up another $400 million or so a year. The most ambitious – one that reaches a 95% graduation rate across the state – calls for more than $2 billion in additional spending for schools. It quickly became clear that purchasers of the study – by and large the Republican leadership in the Senate – suffered from some buyer’s remorse. Oh, yeah, there was a vote on due process…. This was a very irritating experience for me. We had a bill that dealt with teacher due process – which the legislature stripped from state law in 2014. Though school boards had the ability to retain due process, the overarching state provision that applied to all teachers was gone. Note: Due process is often called tenure, and that’s not really the case. Due process is just an extra provision that requires school districts to do their homework if they want to get rid of a bad teacher, and it provides a mechanism that allows teachers to appeal a firing. If the district has done its work, and the firing was justified, there’s not an issue. But this prevents good teachers who are vocal advocates for their students from being terminated just because they don’t go along silently with administration. What was irritating about this was the amendment that was brought to the floor. It sought to extend due process to every government employee at every level – all the way down to dog catcher and garbage man. It was, I believe, meant to make fun of the due process provision – and highlight that it’s a measure that’s not offered to other government employees. Instead of making that argument on its face, the way we chose to deal with this was to offer a bogus amendment and have debate over it. I was really disappointed that this is how we chose to handle this disagreement. In the end, the amendment failed and the due process vote advanced. What to watch for for next week…. There’s a bill that doesn’t seem like much that we’ll be debating on Monday. But, it’s shaping up to be a big deal. HB 2421 is a bill creating a sales tax exemption for the sale of gold, and other collectible, coins. Simple, right? Not so fast. This is a tax bill, and as such, it’s open to all sorts of amendments. Including amendments on sales tax and income tax. That’s why we’ll likely spend Monday talking big tax policy. Rep. Tim Hodge had hearings on some bills he’s proposed to lower the sales tax on food from 6.5% to 3.25%. To do that, we have to pay for it, and the way he proposes we do that is by a tax on filers who make more than a million dollars a year. This likely will be an amendment that will be offered Monday on the coin bill. On the other side of the aisle, we hear there will be an amendment that proposes and end to sales tax exemptions on services – haircuts and things like that – and likewise using the money to pay for a cut to the sales tax on food. Kansas taxes food at the full sales tax rate of 6.5%. While Brownback & Co., talked about being fiscally conservative and returning money to the people, they really didn’t do that. They helped a select group of people do better – and we have the data to back that up, too. Dropping the sales tax on food helps everyone – rich and poor. And when I asked a group of people in Hutchinson which tax they disliked the most, it was overwhelmingly the sales tax. (Also, let’s not forget that we’ve raised the sale tax twice to pay for the income tax that Brownback supported. So not really a tax cut after all). 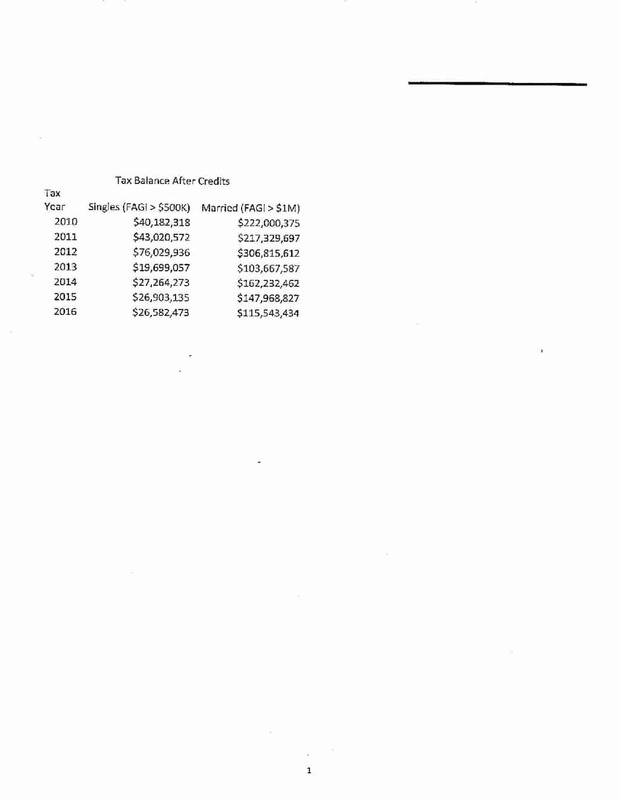 Historical taxes paid by filers making over a million dollars. Note the big drop after 2012. I’m glad we’re having this debate, and I’d encourage you to contact your lawmakers and tell them if you support Hodge’s efforts. Believe me the groups that don’t will do that. It’d probably be worthwhile to listen in on the debate, if you can swing it. I anticipate an interesting debate. Several weeks ago, the House passed out a bill that created a broadband expansion task force. This group would have the mission of studying broadband access in Kansas, and figure out some good ways to get better service to some areas of the state that desperately need better internet access. 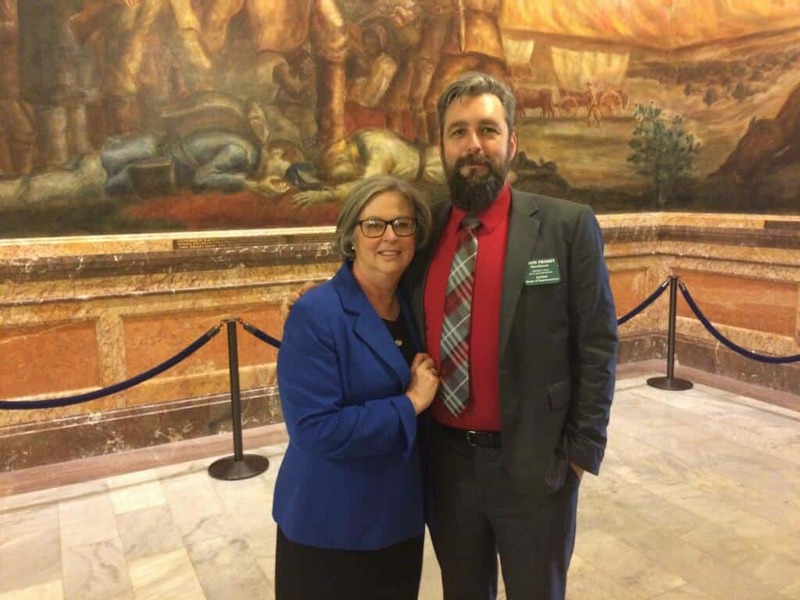 Last week, Buhler’s Daniel Friesen, of IdeaTek, testified before the Senate Commerce Committee – and the bill was amended to secure a voting seat for someone representing independent fiber internet providers like IdeaTek. This, I think, is an important voice to have at the table as we discuss ways to improve internet access in Kansas. This week, Friesen again traveled to Topeka to speak to a rural broadband study group – a small group of people who meet every week to learn about the issues facing rural Kansas when it comes to broadband access. The group was glad to hear from Friesen, and later commented that he provided a lot of good information. I’m grateful he was willing to make the trip to speak to our group, and look forward to additional discussion on this matter. I’ve made no secret of my feelings about the urgency in getting better internet access to rural areas. Fast and reliable internet is today’s equivalent of the railroad – if your town has it, you’ll thrive, if you don’t, you’ll struggle to stay alive. This is a critically important issue for rural Kansas, and I’m glad it’s receiving thoughtful and deliberate consideration. If you want to read more, check out The Hutchinson News report. We voted on a very contentious bill – SB405, which is commonly referred to as the Chicken bill, or the Tyson bill. This measure sought to create an equivalent animal conversion unit for confined feeding areas of chickens using a dry manure system vs a wet system. Or how many chickens equal a certain number of cattle. The debate was heavy. Those who supported the bill did so largely because this would create a clear way for companies like Tyson to enter the state with a processing facility and the supporting chicken farms. Those who opposed it cited serious concerns about the environmental costs. There were two attempts to amend the bill, both of which I supported. One would’ve allowed a local protest vote in a location eyed for such a plant. The other adjusted the numerical equivalent of a chicken to lower the number of confined birds that would trigger a permit requirement. It would’ve also aligned the state law with federal law – and would’ve provided an extra level or protection for the environment while still allowing development. I supported both amendments. However, since they failed, I opposed the underlying bill. I felt it was too in favor of industry and didn’t give even a nod to those who expressed concern about the impact of such large facilities. I thought the amendments would’ve created a good piece of compromise legislation that I could’ve supported. Besides, my thinking is that Tyson was all hot-to-trot to build a plant in Kansas without this legislation, so I’m not totally buying the idea that this law was needed to spur investment from the big chicken industry. Every now and then, friends come to the Capitol for different events. This week, my friend Dell came up as a representative of the Hutchinson Community Foundation. Along with her was Mark Richardson, who was in town for WEALTH Day (Water, Energy, Air, Land, Transportation, Health), sponsored by the Climate and Energy Project. It was nice to have some time to visit with them. Others have come up too during the session. Know that I’m thrilled to have the chance to visit with you! This happens more than you’d think. With 125 people in the House chamber, it’s likely that some of us are going to wear the same sort of clothes on any given day. Sometimes, it happens that the people in your immediate area wear the same duds on the same day. 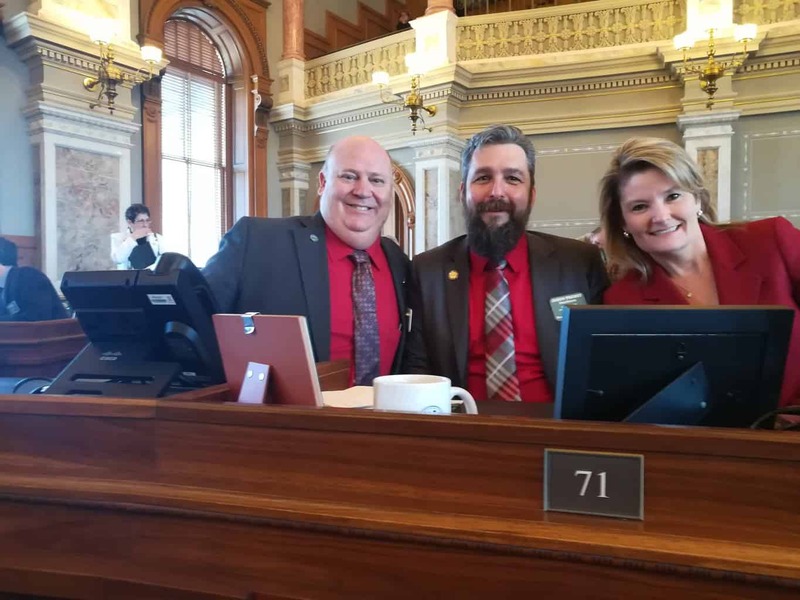 That happened this week – with Reps. Cindy Holscher, Steve Crum and me all wearing red on the same day. Other activity from this week…. On Wednesday, the House Democratic Leader offered an amendment on SB 335 to expand Medicaid. There were several pieces of language in the legislation that would render the amendment germane; however, the Rules Committee found the amendment to be nongermane. To be found nongermane means that the amendment cannot be attached to the underlying bill. The ruling was challenged by the House Leader; a ruling challenge allows the entire body a vote to either uphold the ruling or overrule it. The ruling was sustained in a 77-45 vote. Kansans overwhelmingly support the expansion of Medicaid, which would cover 150,000 people who are currently without insurance in our state. Kansas has refused millions in federal dollars for expansion – tax dollars that Kansans pay into the system. Last year, the House and Senate both passed a Medicaid expansion amendment, which was swiftly vetoed by then-Governor Sam Brownback. The House came just a few votes shy of overriding that veto. Kansas House Democrats will continue to fight for expansion and for the people who need it most. HB 2650: Designates the state rock as limestone, the state mineral as galena, the state gemstone as jelinite amber, and the state fish as the channel catfish. HB 2541: Enacts the Statewide Broadband Deployment Authorization Act. HB 2516: Creates a law providing immunity from civil liability for damage to a motor vehicle for a person who enters the vehicle, by force or otherwise, to remove a vulnerable person or domestic animal. HB 2527: Creates the crime of knowingly selling, purchasing, installing, transferring, manufacturing, creating, designing, updating, repairing, using, or possessing automated sales suppression devices. SB 335: Incorporates savings and loan associations and savings banks into the State Banking Code. The bill would repeal the existing Savings and Loan Code. HB 2232: Allows a resident of an adult care home, or a resident’s guardian or legal representative, to conduct authorized electronic monitoring in the resident’s room subject to requirements. HB 2749: Renews existing sales tax authority for Jackson County to impose, subject to voter approval, a countywide sales tax of 0.4 percent to finance public infrastructure projects. HB 2489: Clarifies the Multistate Tax Compact under Kansas statutory provisions relative to the definition of business income for corporation income tax purposes. Feel free to reach out to me with any comments or concerns. I want to hear from you! Email me at jason.probst@house.ks.gov or call my office at 785.296.7645. You can also follow me on Facebook, Twitter, and Instagram – @thatguyinhutch.